"It is the child in me that loves watercolors, perhaps because they are so spontaneous. Watercolor wants someone who is willing to play. It asks us to make friends with uncertainty; reminds us that if we are free enough to enjoy the surprises, exciting things will follow." 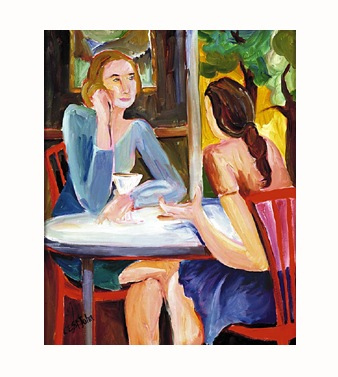 "Les Confidentes" 18 x 24 format for $250. Carol Egmont St. John is both writer and artist. She has maintained an open summer studio in Gloucester, Massachusetts for the past five years and recently opened a winter studio/gallery in Tubac, Arizona. Her works are in private collections around the world. She is currently presenting a large body of work in a one women show in Boston. have been attended by students from across the country. The workshops held in the summer of 2001 will be from June 18th, through the 22nd on the Artist's Wharf in Gloucester, in America's oldest working art colony. A second painting workshop in creativity will be held in July from the 16th to the 20th. They are intensive weeks of self-exploration. St. John invites her students to discover their muse and promises a transformational experience by the end of five days. Former workshoppers return to reacquaint themselves with the magic. Days begin with silent meditations on the beach, a group breakfast at Sailor Stan's, (both optional) and then proceed with journal writing and art activities that are designed to awake the senses. Workshops are limited to twelve and therefore early application is advised. There is a discount to help with your decision-making. Included in the package are sunsets over the harbor, an excursion to Ten Pound Island, a poetry night with published local poets and an art walk with talks by artists about their work. St. John is a published writer, and a former teacher of the gifted learner. She has taught at all levels of education from pre-school to college level courses. She has a masters in writing and an undergraduate degree in education. Her passion lies in the power of creative endeavor to heal and lift the human spirit. These pages are designed and maintained by Castano Design Associates. ... For Corrections or Update please contact: castano@shore.net. This page All contents Copyright © 1995 - 2000 Jo-Ann E. Castano . All Rights Reserved.